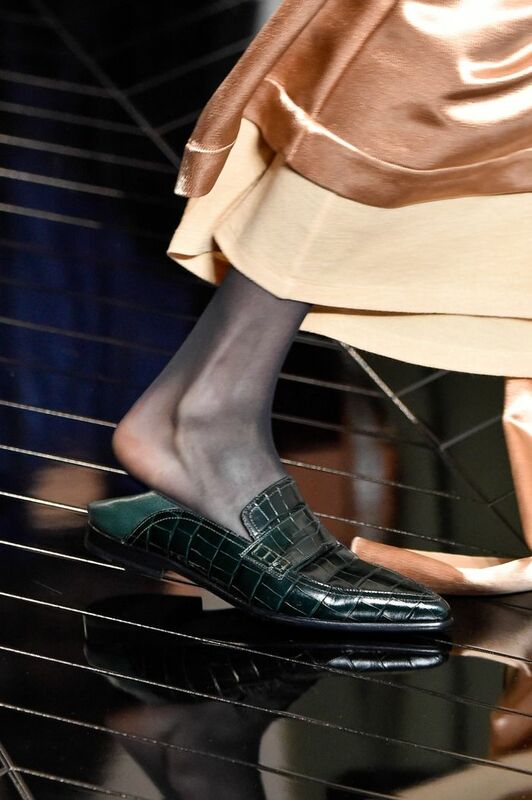 If there's one thing that's certain, it's that fashion is not getting rid of the mock croc shoe trend any time soon. And to that we say, hurrah! The luxe looking textured shoes were seen all over the spring and fall 2019 runways, and will unquestionably be your best investment this year. Mary-Janes have been taking over our Insta feed one strap at a time this season. Their charming aesthetic adds a playful touch to every outfit—and luckily they'll be sticking around for fall. Wear them with sheer tights or socks when the temps start to cool. Fashion girls were seen wearing over the knee boots in abundance during fashion month—creamy ecru tones were particularly popular—styled with midi skirts, loose trousers, and long shorts. Luckily the fall runways were also rife with tall statement boots—from shearling styles at Celine, and satin textures at Fendi. Layer a pair under a midi dress or skirt or over a pair of skinny jeans for your chicest look from spring to fall. Whether it comes in the form of party shoes, loafers, or ’70s-inspired boots, platforms are big news for spring, and judging by their bountiful presence on the fall runways, we guarantee the chunky sole is here to stay. If you invest in platform sandals for spring, you can wear them with tights come fall. From combat boots to chunky leather flatforms, punk rock–inspired boots have been gaining momentum over the last season and continue to reign supreme for spring and fall. The trend is focused more on the thick, chunky rubber sole rather than a specific silhouette. Both ankle and tall boots were omnipresent on the runways at Prada, Alexander McQueen, and Bottega Veneta. Don’t give away those Doc Martens just yet. It’s time to embrace a cool fall breeze flowing between your toes come September: Open-toe sandals and mules are a huge trend for autumn. For the softies among us (that’ll be me! ), wear them with a pair of chic sheer tights. Lace-up boots were spotted on our favorite muses throughout S/S 19 fashion month, and they continue to be a fashion-girl favorite for fall. If you haven’t already invested in a pair, may we suggest this budget-friendly version below? While pointy toes continue to be popular year-round, there has been a resurgence in a strong square toe this spring. By Far has great square-toe sandals right now that you can wear with tights in fall, or invest in trendy square-toe boots you can wear now and later. If the chunky platforms or flatforms aren’t your cup of tea, you’ll be happy to hear that delicate kitten heels are here to stay. Opt for a pop of color as seen at Erdem or petite heels with charming details and pretty fabrics seen at Dior. Up next, these are the 8 shoe trends everyone will wear in six months.